Strawberry Shortcake file, I is cooool. My fingernails aren't dirty, itr's smileyfaces on them! Spent mostly helping Addie and Cheryl with house council campaigning. 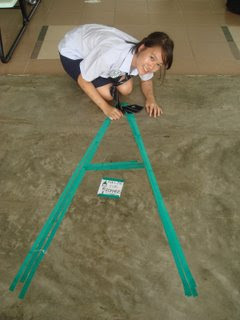 We pasted a giant "A" on the canteen (fine, cafeteria) floor! 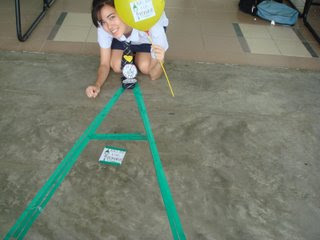 I'm so decorated please, walking advertisement for 4 different people. Student Council put up a "Feedback board" and comments up there were generally very funny! ie: There is a handicapped toilet on the 4th floor but no lift. Addie and I went for dance practice on Friday and it turned out to be Rapture auditions. We were tested on contemporary and hiphop............. Let's just say that we came out convinced we'd be cast as trees hahaha. We went to J's house for his birthday party, at One Tree Hill okay don't messsss. There were signs leading all the way from behind Wheelock Place to his house, which is pretty big. The food was really good and although it was a barbacue, we basically sat there and got served beef, prawns, noodles, sausages etc etc. And there were Ben&Jerry tubs of ice-cream for dessert! 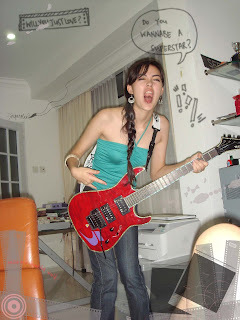 Sophie RoCkEr ChIcK, can Avril Lavigne already! Addie and I went sheesha after that with Ben and Gerald! Haha we mostly spent our time playing around with the smoke, guinea pig being The Dragon (Gerald), he always blows out BIG clouds of smoke (sxxxxer what). Haha he has 3 piercings and wants to get those enlarged earhole thingys please, and we're all convinced Ben wants a tongue piercing just so that girls can play with it if they french him. Sheesha smoke is really cold! Look the smoke stays there! We spend every day willing it to pass quickly, to get to the weekend. After that we will every week to pass quickly, to get to the holidays. And then we realise it all went by so fast. Half of one of the supposedly best years of my life just sped past. I'm almost 17, JC ends next year and then we're almost adults.